May 30th 2014, marked the beginning of an adventure of a lifetime: the 2014 Canadian Battlefields Foundation Tour. As one of twelve students selected carefully from across Canada, I, Marko Kljajic, began my journey to commemorate the Canadians that served during the First and Second World Wars. Celebrating and honouring the Canadian men and women in uniform was a significant part of this two-week long tour, however, it was not my only mission. I sought to understand: who, what where, when, why, and how I am. It was for this reason that this tour was an adventure of a lifetime. My history is not my own. I may be the author of a story, its narrator, and central protagonist, but it is not only mine. When authors exchange their life experiences, their stories become forever intertwined. Each of us has a story. The twelve of us – Allison, Amanda, Emilie, Jordan, Julien, Marlee, Maryse, Matt, Ryan, Sarah, Tyson, and myself – came from different regions of Canada, from the Western Prairies to the Maritimes. We came from different backgrounds, shared different viewpoints, and had different goals and aspirations. Even so, we were all tied by this shared experience. But, what connected us to one another was not simply our two weeks spent together, but a common history that – whether we are conscious or unconscious of it – has shaped our personal character. We are all connected – future, past, present. The present moment forms a past and determines a future that is given meaning by the past. We are all Canadian. This category of nationality is a central aspect of my identity. But, what does it mean to be a Canadian? My journey over the next two weeks was oriented around this question. A ‘Canadian’ may be like all other concepts of the social universe – simply a construction. I believe, however, that, at its core, there lays a unique set of qualities. ‘Canada’ and the ‘Canadian’ represent a set of values and practices of democracy and democratization; economic security; protection of human rights; tolerance of diversity; respect for the environment; social equity; and an engaged civil society. At first glance, this is a standard description of a liberal society, much like the United Kingdom, France or the United States of America. Indeed, these nations share a common set of institutions, however, each is still distinct from the other. There is thus a ‘Canadian Way.’ The men and women, who served during the First and Second World Wars, whether overseas in faraway Europe or at the home front, sacrificed and devoted themselves to something greater than themselves. There were certainly many reasons behind why one chose to enlist or help – from the belief in righteousness to the harsh reality of necessity. Beyond individual intentions, however, I believe their collective deed represented something much greater. Their actions symbolized the struggle for a particular way of life, and not only for themselves, but for those who lived under oppression and whose lives were torn by the scourges of war. This is especially pertinent to me as an immigrant to Canada. My family fled from Yugoslavia amidst the civil war that consumed the country. In search of a new home, we were embraced by Canada with open arms; it did not matter from where we came. Growing up in this unique, ethnically diverse and multicultural society showed me that difference was not a justification for oppression and violence. We could all stand together as equals, as Canadians. I learned that freedom and peace are not guarantees, but ideals that must be secured and protected, often with the highest cost: life. With this in mind, I am grateful for the Canadian troops and peacekeepers that helped to bring general peace to my former country. But, as a citizen of Canada, I am indebted to the soldiers who served and sacrificed their lives for this country. Without their acts of bravery and courage, I would not be the individual I am today. As a collective, the stories of these millions of men and women, shapes what it means to be a Canadian today. Their stories are thus part of mine. My history is not my own. As the author, narrator, and protagonist of my own story, I needed understand them – in their greatest triumphs, their lowest disappointments, and even when times were ‘mundane’ – in order to better understand my Canadian identity. This tour was a adventure of a lifetime. 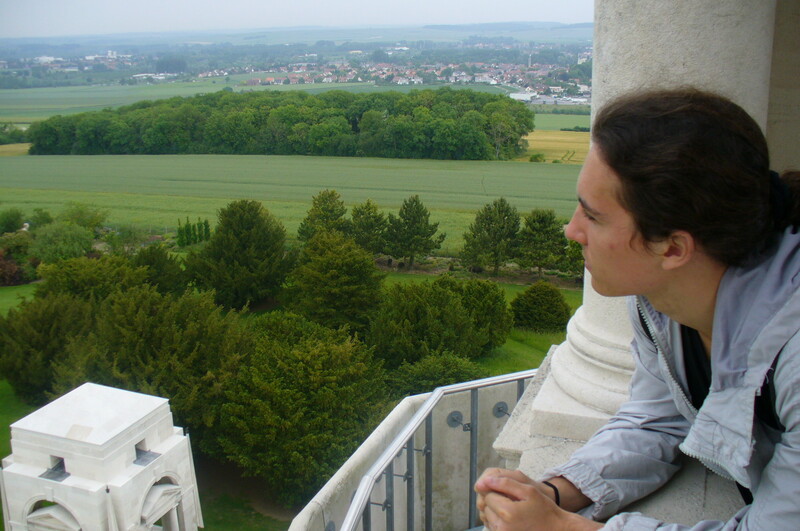 Travelling though Belgium and France and studying the Canadian battlefields has given me a more complete understanding of the subject matter and a deeper understanding of myself in history. The historian often writes and studies on a topic years, decades, and even centuries from when it happened. This tour has demonstrated to me that the historian must visit and analyze the place of their study. It is essential to the historian’s craft. At the same time the historian explains and describes the past, he or she is exploring the deeper levels of their identity. My pen may be responsible for writing my own story, but what is it that guides the pen across the page? The guiding force is history. It is one thing to learn history, but it is another thing entirely to experience it. For my final remark, I would like to thank the fellow participants of the 2014 Canadian Battlefields Foundation Tour – Allison, Amanda, Emilie, Jordan, Julien, Marlee, Maryse, Matt, Ryan, Sarah, and Tyson – for the wonderful memories, our photographer Rob for taking the time to take thousands of pictures, and our amazing tour guides Professor Milner, Colonel Patterson, and Bobbi Milner, for your knowledge, patience, and support. All of you have made this trip an unforgettable experience that I will cherish for the remainder of my life.